"For over 100 years, Thermos® brand insulated products have been keeping food and beverages hotter, cooler and fresher. Today this commitment continues with an expanding range of innovative, fashionable products that preserve flavor and freshness. When it says Thermos, you know what to expect - they just deliver it in ways you'd never expect. The stainless steel Poppy Patch Foogo Vacuum Insulated Leak-Proof Straw Bottle is BPA, PVC and Phthalate Free. The foogo phase 3 is best for 18m+. Thermos vacuum insulation technology gives maximum temperature retention. The BPA-free bottle has an unbreakable stainless steel interior and exterior." What we thought: A loves her new water bottle! She is 6 and it is the perfect size for her, plus she says it's "so pretty!" It really does keep her water cold for hours at a time. Of course, my favorite feature is how easy it is to clean! The pieces come apart for easy accessibility to those hard to clean spots. This bottle has been great for summer. Once school starts this will be an integral part of the lunch box! 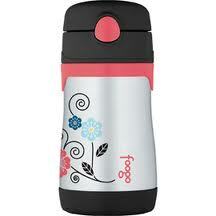 ABCD Diaries gives the Thermos Foogo bottle an A+!